Russian universities have made a strong showing in Britain’s 2015 Times Higher Education ranking, with Moscow State University featuring in the top five educational institutions in the influential listing’s BRICS & Emerging Economies Ranking. RBTH reports on the improving global competitiveness of Russian universities. 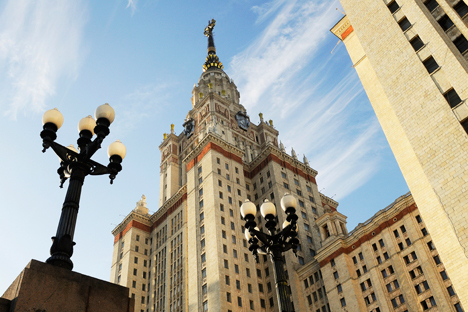 Russian universities have made an important breakthrough in Britain’s 2015 Times Higher Education BRICS & Emerging Economies Rankings, with Moscow State University coming fifth in the rating. The ranking – the second report of its kind by the influential international listing – was presented at the first BRICS Universities Summit in Moscow on Dec. 4. China’s Peking University and Tsinghua University led the top five, in first and second place, respectively. They were followed by Middle East Technical University in Turkey (third place) and South Africa’s University of Cape Town (fourth). The best university in Brazil – the University of São Paulo – came tenth, and India’s best university – the Indian Institute of Science – took 25th. In addition to the BRICS countries, universities from the Czech Republic, Poland, Mexico, Morocco, Thailand, Hungary, the United Arab Emirates, Malaysia, Taiwan (its rating is counted separately), and Pakistan also made it onto the list. Why are Russia’s universities struggling in international ratings? Altogether, seven Russian universities were in the top 100. Besides Moscow State University, they are: the National Research Nuclear University (13th); Novosibirsk State University (34th); St. Petersburg State University (64th); the Moscow Institute of Physics and Technologies (69th); the Ufa State Aviation Technical University (70th), and the Bauman Moscow State Technological University (90th). Only two Russian universities made it into the 2014 Times Higher Education BRICS & Emerging Economies Rankings: Moscow State University (10th) and St. Petersburg State University (67th). Britain’s Times Higher Education is one of the most influential international magazines on higher education. It compiles an annual world university ranking that, besides the QS World University Rankings and Shanghai’s Academic Ranking of World Universities, is considered one of the three most authoritative in the world. Yaroslav Kuzminov, rector of Moscow’s Higher School of Economics (one of Russia’s top universities, but one which did not make it onto the list) told RBTH that government efforts are responsible for the success of higher education in Russia. According to him, the state has been systematically investing in ways to boost university competitiveness since 2006. Why do the BRICS countries need their own ranking? Asked by RBTH why the magazine has started ranking universities in emerging countries separately from the rest of the world, Times Higher Education Editor Phil Baty said that the main purpose is to help find new education leaders in countries that remain in the shadows of North America and Western Europe, which dominate the magazine’s main rankings. "It's like switching on all electric lights, so we can see the rising stars. There is a sense that in the overall world rankings there are only 10 universities from the emerging economies visible in the world top 200. So what we are trying to say is that there are really dynamic and exciting universities in these regions that are crowded out from the ranking due to the dominance of the U.S. and Western Europe,” Baty explained. Moscow State University, which ranked in the top five of BRICS universities, stands at 196th in the World University Rankings 2014-2015. The top 10 list is dominated by seven U.S. universities and three from the UK. However, Baty stressed that the decision to separate BRICS out into a different list does not make it “second-class,” because the emerging economies ranking utilizes the same criteria as the world ranking. "We are able to put them into context. Not everyone is able to compete with Stanford or Oxford, so we are actually using the same system and benchmarks; we are able to give more data, more information on a larger range of universities and give a clearer picture of their potential and the place in the world,” Baty said. A challenge to Western education? According to Director of the Institute of Education at the Higher School of Economics Isak Frumin, there is another important reason experts should pay attention to the BRICS & Emerging Economies Rankings. He thinks emerging countries might form a unique system of higher education in the future that will differ from the prevailing American-British system of today. In countries like Russia and China, the governments are unsatisfied with the simple evolutionary development of their universities. They think the process is going too slowly, so they are picking out groups of universities where they will foster conditions for rapid development and invest heavily, Frumin said. The purpose of these investments is to create world-class universities in short timeframes. Russia launched an accelerated development program for universities called 5-100 in 2013. The formal objective of the project, which included 15 universities (now 14) at the initial stage, is to get at least five Russian universities in the top 100 of the three aforementioned world university rankings by 2020. Besides the 14 universities in Russia’s ambitious 5-100 program, some 30-40 Russian institutions of higher education have dramatically improved the quality of their education in recent years, Yaroslav Kuzminov told RBTH. “This is a result of the fact that in 2006, then-Education Minister Andrei Fursenko initiated the idea of separating out the group of universities that was provided with targeted support for development programs,” he said. “Originally there were 62 universities. Twenty-nine of those were selected in 2009. Finally, the so-called 5-100 program started in 2013, and the 15 universities with the best possibilities for international competition were selected,” Kuzminov said. “Those universities have English language programs, they are best prepared to accept foreign students, and they are competitive in their research,” he added.